Skin sensitivity has become a bit of a catch-all term for three distinct types of skin problems: rosacea, contact dermatitis and skin that burns and stings. The common link is inflammation, which is often worsened by chemicals and yep, fragrance. That beautiful, possibly all-natural range awash with essential oils that you love could be the reason your skin is reacting, and the environment also plays a major role. The US-based Environmental Working Group recently revealed that modern women are exposed to a daily average of 126 chemicals from cosmetics, cleaning supplies, pollution and even the food they eat. The list of potential skin irritants is a long one, and we are exposed to more and more of these with our changing lifestyles and environments. 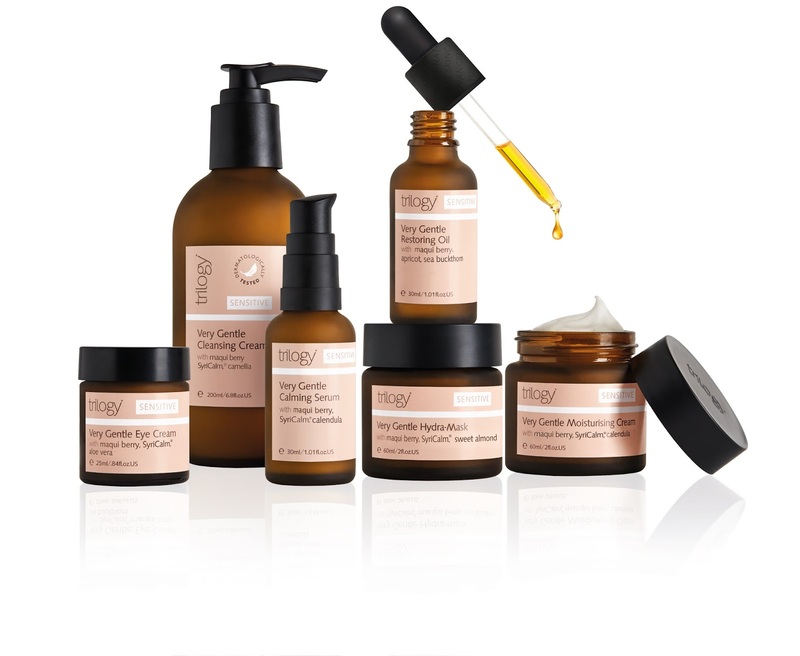 Sensitive skin needs specialised care to help provide relief and reduce redness and inflammation, and Trilogy have thoughtfully considered the sensitive types among us and our changing needs by reformulating their newly repackaged Trilogy Sensitive range. The introduction of three new innovative products completes the regime of certified natural, dermatologically tested skincare especially crafted for highly reactive and sensitive skin types. Trilogy Sensitive is designed to bring comfort to even the most fragile, intolerant and reactive complexions, and the new formulations include skin-rewarding maqui berry and sea buckthorn which are combined with the current range hero ingredient SyriCalm® to offer added repair, nourishment and protection. So, what more can be revealed about the ingredients included in the newly reformulated Trilogy Sensitive range? Maqui Berry: this is a new super-oil high in antioxidants that helps to target free radicals which can cause skin irritation. With 80 per cent essential fatty acids to protect and reduce cell damage and disintegration, it naturally helps reduce redness and inflammation. • _Sea Buckthorn: containing nature’s richest source of Omega-7, this beauty is vital for collagen production, healthy skin and to protect against oxidative damage. It restores skin cells and helps reduce fine lines and winkles for smooth, soft and comfortable feeling skin. • _SyriCalm®, a natural active that contains a blend of two naturally occurring ingredients (phragmites kharka, a reed extract, and poria cocos, a pine tree derived fungus). SyriCalm® has been clinically proven to reduce inflammation and strengthen the skin’s barrier, making it more resilient all round. My pick so far of the new releases is Trilogy Very Gentle Restoring Oil, which is a deeply nourishing and restoring pure plant oil that has gone straight to work on my Winter weather-battered skin. Combining essential fatty acid and antioxidant-rich new super-oil maqui berry and Omega-7 rich sea buckthorn, the certified organic beauty oil is especially formulated to help nourish, repair and protect even the most fragile and intolerant skin against free radical and oxidative damage. Apricot oil containing vitamin A and E is also in there to soothe the skin and help slow the signs of ageing. Perfectly suited to sensitive and highly reactive skin, Trilogy Very Gentle Restoring Oil is fragrance-free and dermatologically tested. Also new is the Very Gentle Hydra-Mask that I’m going to try this weekend, and Very Gentle Eye Cream, a lightweight and easily absorbed formulation that contains antioxidant-rich maqui berry to target free radicals and reduce redness and inflammation, SyriCalm® to strengthen the natural skin barrier function and provide relief and comfort to stressed skin, and aloe vera to help maintain moisture balance while soothing sensitivity and irritation. The new range is available right now from selected Farmers, pharmacies, department and health stores nationwide. For more information, visit trilogyproducts.com.